The Excel Economic Data add-in (FRED) provides direct access to country macroeconomic statistics data which has been harmonized from international statistics agency sources including the Census Bureau, BEA, BLS and OECD. The economic statistics consist of more than 80,000 data time series and are classified by geographic and subject matters. Instant download of economic time series for chosen countries and measures. The most popular economic series are made for quick access. 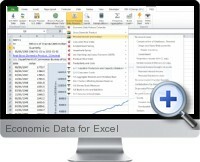 Data search function allows to return matching economic series by keywords. Switch between raw and defined period growth rate data directly in Excel. Change the time periods with global input cells with automatic update. Quick and easy data frequency conversion and growth rate calculations. Downloaded data instantly refreshes and updates when new data is released. Charts can be created with National Bureau of Economic Research (NBER) recession shading which update automatically. Create charts with multiple series for comparison analysis. Optionally specify the number of latest observations to download to accessing only recent economic data or making updates. Detailed help guides and version update checking assist with productivity and efficiency. Compatible with Excel 2010 and Excel 2013.